Ashlee Dillon: I don't know where I am going, but I'm on my way. I don't know where I am going, but I'm on my way. I have and have always had a strong to desire to travel the world - wanderlust I think they call it. I am planning my next venture to North America. Flying from London going to LA and giving my self a month to travel across and leave from NYC. I have been to a few places around the world; South Africa, parts of Europe, Central America but I have always felt this strong urge/pull to the USA. My mum has this idea that it may be from our ancestors going over 100's of years ago and finding it - although I'm not really sure if we were related to anyone that found it?! I am from a city called Plymouth, South West England. We have a lot of history here, especially in relation to sailing and pirates for example - Sir Francis Drake. After doing some research, I found out that the Statue of Liberty arrived in New York City on the 17th of June 1888. Of course I was neither born or even thought of then but my birthday is on the 17th of June - just a coincidence right? Well what ever the reason is I am on a mission to travel there and find out. Maybe it is the pure fact that it is just an amazing country. A country so full of different climates, traditions and people. From the vast desserts in Nevada to the stunning beaches of Hawaii. There is so much diversity and I cannot wait to experience it. 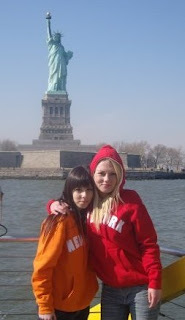 When I was 17 I went to the USA for the first time on a college trip. At the time Alicia Keys "New York" had just came out and what a brilliant description of NYC that was. When I arrived in New York - just like the song says "now that I have made it here, I can make it anywhere". That is EXACTLY how I felt when I landed. I felt a sense of belonging there. I knew at that point that I HAD to come back and that there was a lot more to America then this small but amazing city. I am hoping to keep a diary of my journey not just on the travel aspect, but of self discovery also. I have travelled solo before but this will be the longest I would have travelled alone and on other travels parts have been guided. This will be completely solo! I want to do minimal research before I go, obviously there are things that I need to research, some for safety precautions but I want to "wing it". I don't want to have any plans as such and I suppose go with the flow. I want to gain a more intense (if that's the right word) of independence. I have had snippets before; moving to university 500 miles away from my home town and also travelling Africa last year - flying that far on my own. So I have built my self up to this massive challage and life event! This was just a draft post really, discussing what I am going to do and why I want to do it. The more exciting blogs will be of the experiences in each of the places that I visit :) Updates to follow... .